The easiest, best place to get a tattoo. I know that the real wise advice I could give you would be; “Get it where you want to see it.” Because after all, the pain is temporary, right? The tattoo is what lasts. But I get asked this question a lot, so I’ll give you my honest, true answer. actually, inner forearms are cool too. For all the same reasons. They’re just harder to hide when you visit grandma. Get it on your outside calf, shin, or on the front or outside of the thigh. These are the easiest areas to get tattooed. They hurt the least, look the best, and last the longest with clarity to the original. Even if you gain and lose weight, these areas won’t change much. Even when you get ancient, the wrinkles on the rest of you won’t really effect these areas so much. If you have to hide tattoos for work, high socks or knee-length skirts will cover one or the other of these. The areas are capable of being used in either a very soft, flowing and feminine way, or a blocked, solid masculine manner- so either way, the space can be used how YOU want it to turn out. It can emphasize the curves or obscure them. It can accent muscle or smooth it. A design with a strong s-curve looks great in either place. The skin structure is good and will be more solid and consistent than ANYWHERE AT ALL ON THE TORSO. Your torso twists, bends, and the skin changes all over it with every pound gained or lost, every gym day or potato chip, every pregnancy, every time you reach for a thing your torso skin gets stretched a tiny bit. Every wrinkle and sag is concentrated on your ribs, waist, and chest. It’s the worst possible area for a tattoo really. Going back to the start of this whole thing- calves and thighs hurt less than any torso tattoo as well. AND they will last longer. It’s win-win. So, if you want my real advice, and not just the thing I am supposed to say, then listen to me and get your calf or thigh tattooed. It’ll look amazing there. Promise. Big or small, get it there. 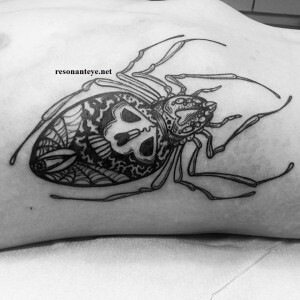 Small tattoos look great just above the ankle bone, or just below the hipbone on the thigh. Big tattoos look great all over the leg. The only “bad” leg areas are the knee, the foot, and the groin. All of these areas have odd skin and won’t last as long or hurt as little as the calf and thigh. 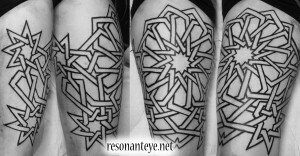 Plus the nice, flat areas of the calf and thigh make the design less likely to get distorted with movement, making them a good place for geometric work, or images with faces or human figures in them. Get your legs tattooed. It’s awesome. so, you want a lot of words in your tattoo. 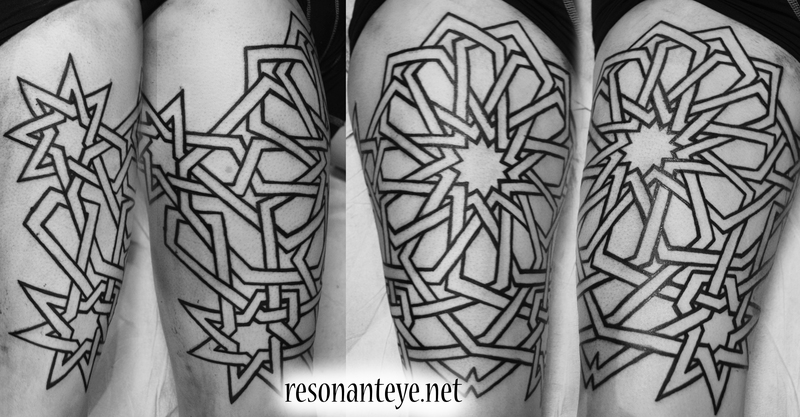 Tattoos of lettering are classic, of course. There’s nothing wrong with getting words tattooed on you. Sometimes, though, you can overdo it. sometimes you really do want to dedicate a lot of skin to words. that’s ok, too, but only if it’s a flatter area where curving muscle won’t impede the reading of it. These are lovely sentiments. On skin, however, with the limitations due to cellular changes over time, they wil end up being about ten inches across and six inches tall. That’s a HUGE area dedicated to text alone. Let’s say you want a tattoo of a hammer and some clouds, with that Emerson poem. Or you want some trees and a path, with that Frost quotation. What’s going to happen is the text is going to completely overwhelm the imagery, and dilute it. 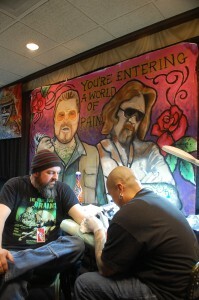 Tattooing is a visual medium. 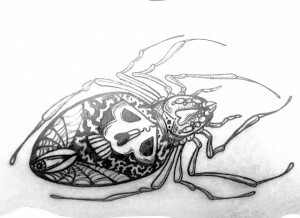 The whole point of a symbolic tattoo is to take a concept (words) and use the tattoo (image) to express it. Adding lines and lines of text to an image….it’s a bit redundant. 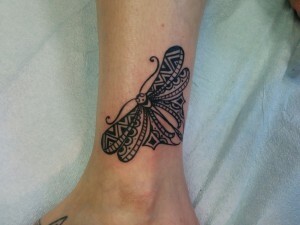 Like getting a tattoo of a bird with the word “BIRD” on it- unnecessary and really odd to look at, in the end. You have choices here, of course. You can opt to get just the lettering, the text itself, alone. Well-done, large-enough text by itself is just fine. It will be bigger than you think, but it can look great. This is a good choice if the writing is from a friend or family member, a case in which the meaning of the words matters less than the exact words themselves. Or if you don’t want any images associated with the meaning on you, at all. In the first tattoo posted above, the client didn’t actually want Peter Pan or anything on her; she simply liked the text itself. Same with the Hobbit poem. You can get just an image that sums up and represents the text. For the Frost poem, a landscape of snowy woods, or a waiting horse next to some trees, would be pretty accurate to the poetry. Done in a bleak color scheme it would represent the sentiment of the poetry really well, too. This is really the best choice if the poem is well-known, or if it’s just the feeling and meaning of the poetry that you love so much. A third option is to narrow down the words you’ll add. For the Emerson poem, you could do a hammer and clouds with the words “Work, Courage” or something similar. Or use only one line of the poem, “Dare while others fly” as part of the design. (In a banner, or similar.) This gives you a bit of the poetry without losing the impact of the imagery as much. “miles to go before I sleep”, done in pale text, below a line of trees…that would be a good solution to using the Frost poem as a tattoo inspiration. I usually suggest to my wordy clients that they go with the third option- I love poetry and books, and think that a snippet of text in a tattoo can actually add to its impact. It also serves as a reminder to the person of the entire written piece. I usually limit the amount of text to about five words, maximum, if there’s any images being tattooed along with it. If someone wants a very, very long quotation I will do it- but I usually suggest treating the text block as an abstract shape, making it curve to fit the body area being tattooed. 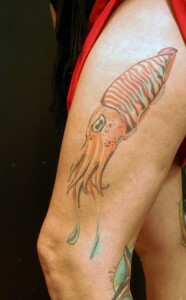 It helps a little, and allows you to get neighboring tattoos later in life without too much fuss. Having a lot of straight lines on a floating block can really limit your future options. If you want one word or short phrase, though, it’s easy. We can treat the text itself as an image, and make it fit. Simple lettering is really fun, playing with text forms is enjoyable and placement becomes a breeze. You can be selective in your quotation and still carry the meaning of the entire text pretty well. You want a tattoo! And you want a tattoo today, or tomorrow. Is it going to happen? 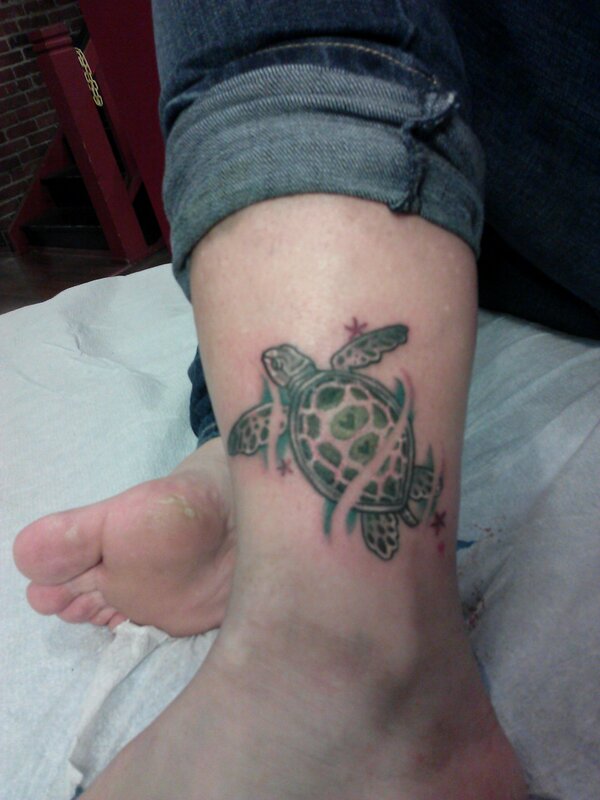 Well, if your tattoo is small, simple, and in an easy area to work on, the chances are good that it will happen. If your favorite shop or artist takes walk-ins or has empty time that day (hint: they’ll usually post on one of their social media sites if they have a cancellation or free time) then it’s even more likely to happen. If all of these things are true, and you call the shop to ask about getting worked on and the counter staff say “come on in, Joe has a few hours open today” then YES, you’re gonna get a tattoo today. But do you need an appointment? Usually, yes. Even on that magical day when all those things come together, there will be some things that make an appointment a good idea. Let me explain what an appointment is, and what it isn’t. A tattoo appointment is a set time during which your tattoo artist will be doing nothing but tattooing YOU. They will mark that time as “taken” in their schedule. Without a deposit, you don’t have an appointment. You probably have a consultation. That’s ok, too. A consultation is a short meeting with a tattoo artist, which culminates in setting an appointment or getting a tattoo done that day. Setting up a consultation is a good idea, so that the artist can give you a price estimate and figure out the artwork with you. In our original, awesome, everything-goes-right scenario, you’d likely get a consult – jotted into the schedule in pencil, it would mean one of two things. You will meet up with the artist for 15-30 minutes and discuss artwork, placement, cost, and all the rest. 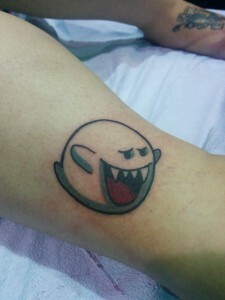 Then they will set up an appointment to do the tattoo at a later time. You’re next in line to get tattooed, and can wait until your turn to get tattooed that day. 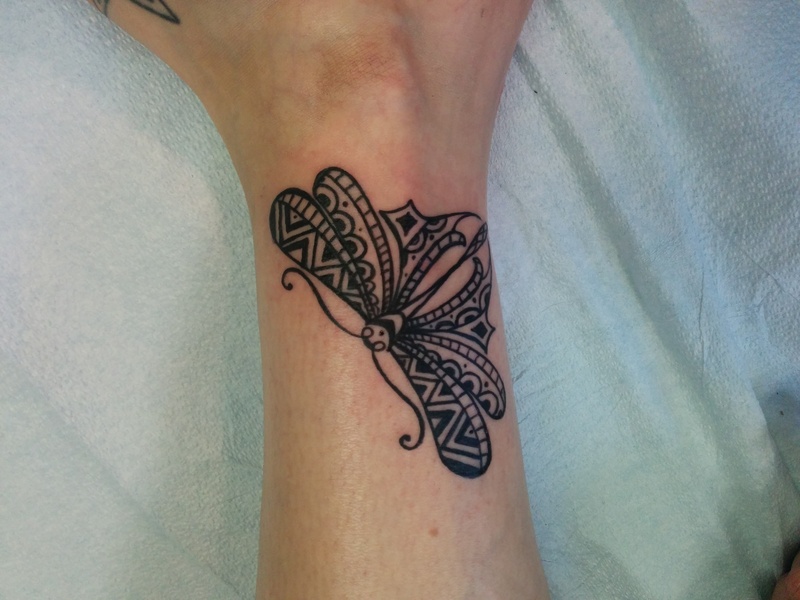 If you have a consult, your artist will meet with you to discuss the tattoo right at that time, but you may have to wait a while to actually get the tattoo. It may need to be drawn differently, or they may need time to figure out technical details to apply it. Someone may have gotten their tattoo started before you arrived, and the artist will finish with them before it’s your turn. If you’re on a tight schedule, make an appointment, not a consult. 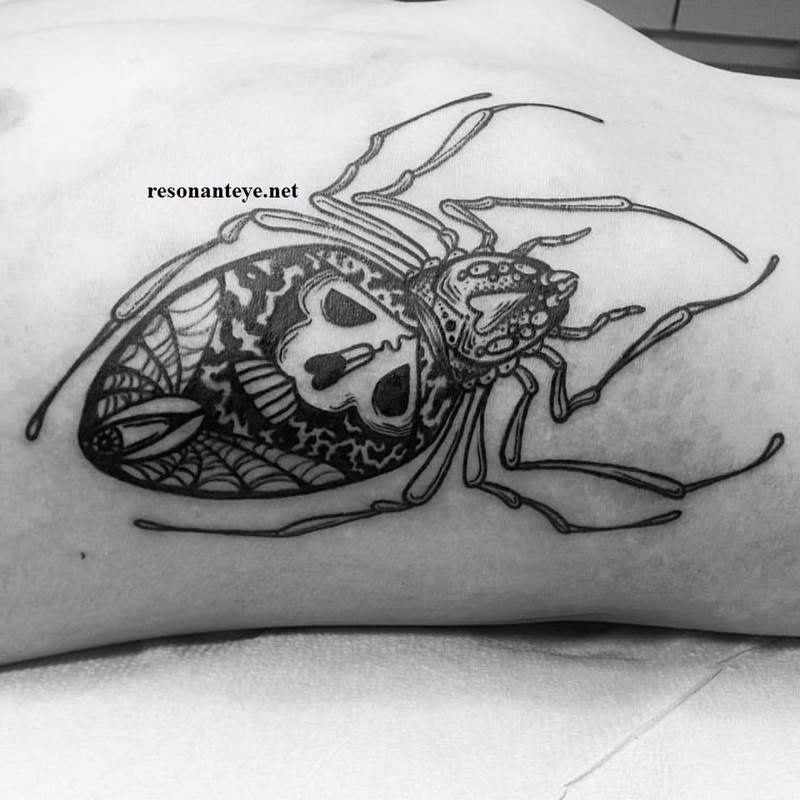 If you aren’t sure whether the artist can draw the tattoo on the spot, if it’s a bigger piece or in an odd place (ribs, hands, etc), if it has complicated elements or meanings, or if you know you might have to come back another day, make a consult and bring along your calendar and ideas so you can plan your future appointment. Hope for the best (getting tattooed today! ), prepare for the worst (waiting until another day to get the tattoo done). A rough doodle I made of the art while we were talking. a brilliant idea for what the finished tattoo will look like. a bunch of notes in my terrible handwriting that seem to have nothing to do with the tattoo but actually are notes about your tastes, aesthetic, ideas, hopes, dreams, and how awesome your glasses were, including a deadline by which I want to get the art finished. finally the appointment day arrives and it begins. Now, let’s talk about just walking in. A walk-in is simply going to the shop, getting in line, and waiting your turn to get your tattoo that day. Some shops and artists encourage this and others don’t like it. Best way to find out if it’s going to work? Just call the shop and ask- “do you take walk-ins?” or “does anyone have time for a walk-in today?” They will let you know. If your art is something that needs lots of drawing time,or if a bunch of other people show up at the shop before you, they may not be able to tattoo it that day. They may not have time. BUT! 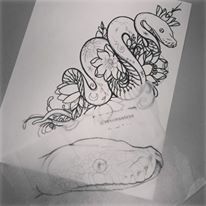 If your tattoo is pretty simple, or if it’s the kind of thing that particular artist likes to draw and can draw easily, then yes you will be able to walk in and wait your turn and get a tattoo, all in one day. You’ll notice that some are very simple, and some are more complex. The complex stuff? It’s all stuff I like to draw, and can draw very quickly and easily right then and there. If you wanted something I wasn’t proficient with, I’d have to make a date for later and really take time with the drawing. Some of these, I had drawn beforehand- in my sketchbook- and people walked in and chose them from my drawings, or asked for something similar and I could use that drawing to work from. So it really depends on the artist, your flexibility, and other factors. Personally, I always leave free time on the weekends to take walk-ins. I love spontaneity, and I have a big collection of drawings of “stuff I wanna tattoo on people” for folks to look at and pick from. 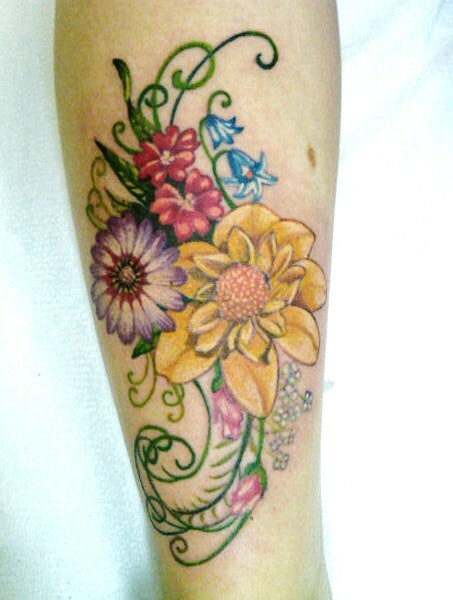 I also like to draw some subjects so much, that drawing then tattooing them is easy for me (flowers, trees, plants). Usually my walk-in days get filled up by about halfway through, so anyone who runs in to the shop late hoping for time is SOL, though. they may look simple enough, but they took planning and redrawing to get right. Yes, some people take walk-ins. Call the shop and ask. Be prepared to wait in line for your turn. Yes, consults are a good thing. You might get tattooed that day,or you might have to make an appointment. Nothing is guaranteed. You don’t need a deposit to talk to an artist and the consultation itself costs nothing. 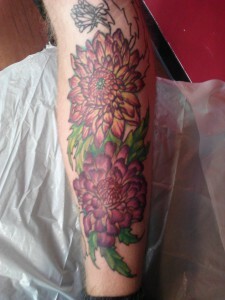 Yes, appointments are the only way to be sure you will get tattooed at a specific time and day. Many times you’ll need to make one anyway, just because the artist needs to work on the concept to make it right. You’ll always leave a deposit to hold an appointment. Good luck, and don’t be afraid to email or call the shop or the artist to find out how they handle each of these things. 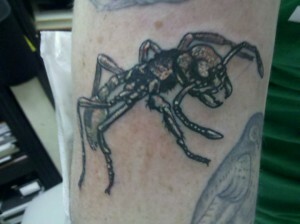 We have counter staff to handle that- we pay them to be nice to you and find a way for you to get tattooed. I like emails a lot, and I do a lot of online consultations too- some artists don’t, this is purely a matter of personal taste. If you have an artist who is responsive about emails, you can always email directly. Don’t be shy, though. We want you to get tattooed, today, or as soon as possible, because we love tattooing you. bonus: a few tattoos that took consults AND appointments to get done. 4 reasons why tattoo clients can't be "stolen"
YOU BELONG TO YOU. Not to a shop, not to an artist that worked on you. in the process of setting up for a white ink tattoo. White ink on the hands. Plenty of tattooers won’t even do this. For good reason, too! White ink does not heal white. It heals slightly lighter than the skin tone, and often unevenly. It ends up looking a bit like a pale scar, nearly invisible. Most tattoo artists who will do tattoos in white-ink-only, will not guarantee it, do a free touchup, after it heals. It’s acknowledged that it will not look right when it heals. There’s a very, very rare person for whom it heals and looks ok- but that person is truly rare. I’ve only ever met one, in 16 years of using white alone in tattoos. 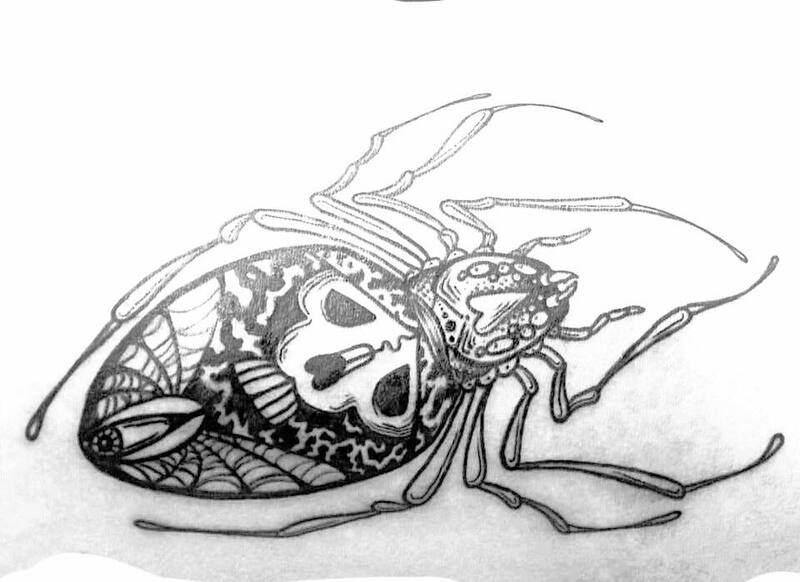 All that said, I will do white-ink-only tattoos. 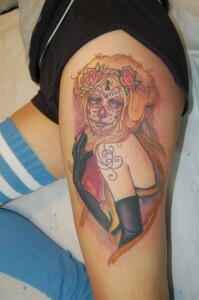 And I’ll even do one free touchup, just like with any other tattoo. BUT, I try to make it really clear that it’ll never heal just right, never look perfect. That it’s going to fade into a pale hint of a tattoo, like a scar. Barely there, and that this is likely to happen unevenly, too. Here are two matching tattoos, freshly tattooed with white-ink-only. 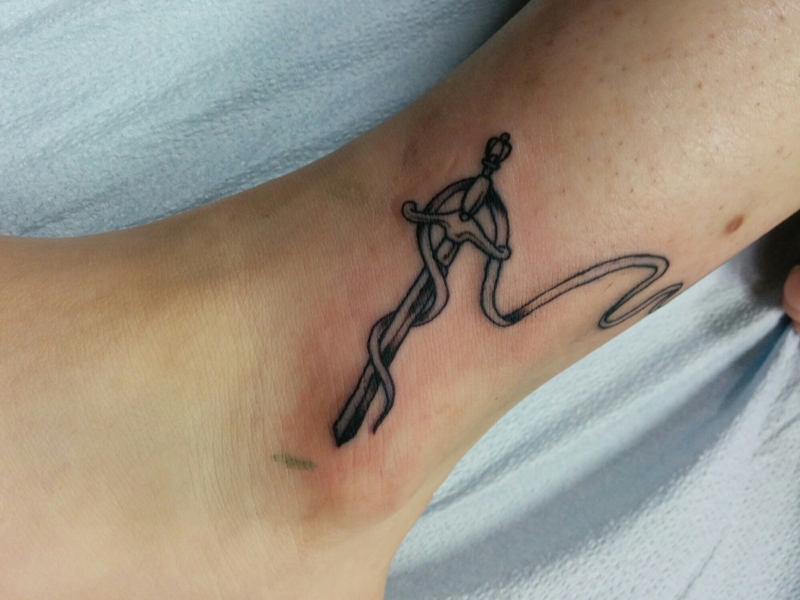 Original, long post about apprenticeships, apprenticing, and the beginning stages of a tattoo career. Reposting for that handful of people who have asked lately! again, because someone asked if I could repost it! click through for the answer.